Shanann, Bella, Celeste killed in Frederick, Colo.
Weld County prosecutors on Monday formally charged 33-year-old Chris Watts with nine felony counts, including first-degree murder, in regards to the deaths of his pregnant wife, Shanann Watts, and their two young daughters. FREDERICK, Colo. – Now that Chris Watts has been formally charged with killing his pregnant wife, Shanann Watts, and their two daughters, Bella and Celeste, he will spend at least the next three months in jail while he awaits a Nov. 19 status conference. Police and prosecutors have confirmed many of the details of the case that have been previoously reported. Chris Watts faces three counts of first-degree murder after deliberation, two counts of first-degree murder – victim under 12/position of trust, one count of first-degree unlawful termination of a pregnancy, and three counts of tampering with a deceased human body, according to Colorado court records and documents filed Monday afternoon. According to an arrest affidavit released Monday afternoon, Chris was having an affair . He also claimed that he was trying to separate from Shanann the morning of the alleged murders and that she tried to strangle their daughters when he told her of his intentions. The unlawful termination of a pregnancy charge comes because Shanann Watts was 15 weeks pregnant at the time she was killed. The documents state : "The woman died as a result of the unlawful termination of the pregnancy." Former Boulder District Attorney Stan Garnett explained the statute in an interview on Friday. Read more about the unlawful termination of a pregnancy statute here. Watts and his attorneys waived his right to a preliminary hearing within 35 days in the case at a Tuesday morning hearing in which Watts was advised of the charges against him. People charged with the highest-degree felonies are allowed preliminary hearings so prosecutors can show cause that the case should proceed in court. Prosecutors will have 63 days after Watts' arraignment to decide if they will seek the death penalty in the case. If they do not, Watts would face mandatory life in prison without the possibility of parole if he is convicted on any of the murder charges. Watts will continue to be held without bond after Tuesday’s court hearing. His status conference was set Tuesday for Nov. 19 at 10:30 a.m.
Law enforcement officials said that Chris Watts is in protective custody and being isolated from other inmates at the Weld County jail because of the publicity the case has received. Shanann’s father, Frank Rzucek, and brother, Frank Rzucek, Jr., were both present at a Monday news conference in which Weld County District Attorney Michael Rourke announced the formal charges Watts would face. At the news conference, the elder Rzucek delivered a brief statement thanking Frederick police and the community for their support. The elder Rzucek was also visibly emotional during the Tuesday morning court hearing; his son comforted him as he buried his head in his hands and wept as the charges against Chris were read. At a bond hearing last week, prosecutors said they believed Watts killed the three inside the family’s home in Frederick. The affidavit released Monday afternoon confirmed previously reported details, citing high-ranking sources, that Shanann’s body was buried in a shallow grave at the site and that the bodies of Celeste and Bella were put inside of oil and gas tanks. Chris Watts had worked for Anadarko but was fired on Wednesday, the day he was arrested in the case. Frederick police last Wednesday confirmed some of the details surrounding Shanann’s disappearance that neighbors, friends and family had been talking about since she was reported missing Monday. The affidavit released this week filled in more holes in the timeline. A friend of Shanann’s dropped her off at her home in Frederick around 2 a.m. Monday . She had been in Arizona on a work trip. Chris Watts claimed in an interview last week that preceded his arrest that he last saw Shanann around 5:15 a.m. Monday when he left home. He said that Shanann’s friend showed up to his door just after noon that day wondering where she and the girls were. Police confirmed that the woman went to the home after Shanann missed a doctor’s appointment and that she first reported Shanann and her daughters missing. Officers went to the home on a welfare check around 1:40 p.m. Monday and confirmed that the three were missing and that Shanann’s phone keys and purse were all left at the home. The FBI and CBI joined the investigation Tuesday. 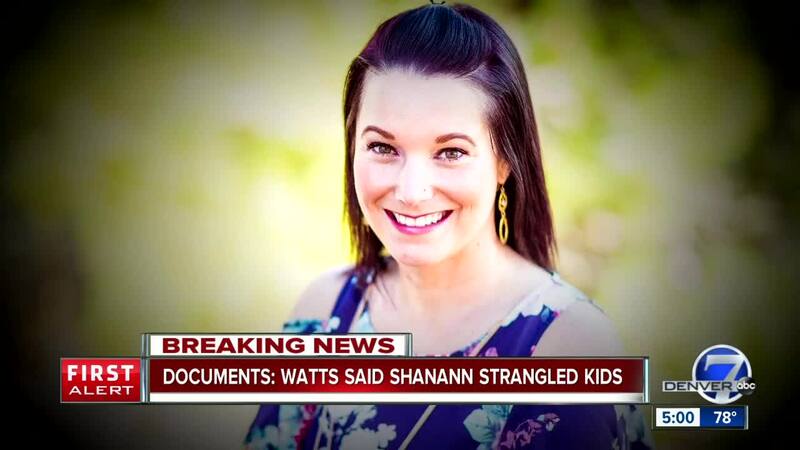 The affidavit, released Monday after Watts was formally charged, says the family friend grew worried about Shanann after she missed the doctor’s appointment at 10 a.m. The friend called Chris and police, worried that Shanann may have suffered a medical episode. Once police and Chris arrived, he let officers into their home, where officers found Shanann’s purse on the kitchen island and a suitcase at the bottom of the stairs. Upstairs, the couple’s bed had been stripped of its sheets and blankets, but police wrote there were no signs of foul play. Chris Watts told officers under questioning that he and Shanann had been discussing “marital separation” that morning before the time he claimed he went to work. “Chris stated it was a civil conversation and they were not arguing but were emotional,” the affidavit says. He previously said that he and Shanann had an "emotional conversation" when they last saw each other. It says that he went on to claim to officers that after he told Shanann he wanted to separate, he saw Shanann strangling their daughters on a baby monitor. When officers showed him an aerial photo of the site, he identified the three places where the bodies could be found, the affidavit says. In an interview, he told a detailed version of what he claims happened when Shanann and their daughters Bella and Celeste went missing, including that he and his wife “had an emotional conversation” before he allegedly last saw her. “I mean, she wasn’t here. The kids weren’t here. Nobody was here,” Watts claimed. He also made a direct plea for Shanann and the girls to come home. “Shanann, Bella, Celeste: If you’re out there, just come back. Like if somebody has her, just bring her back. I need to see everybody. … This house is not complete without anybody here. Please bring ‘em back,” he said. You can watch the full interview by clicking here or analysis in the player embedded below. Nickole Atkinson, the friend of Shanann’s who called police when Shanann didn’t arrive to her doctor’s appointment, said she immediately knew something was wrong . “I knew [Chris Watts] had something to do with it the day I was at his house with him, but I didn’t want to think that,” Nickole Atkinson told ABC News. “Anyone in their right mind will start piecing things together and think something had happened, but you don’t want to go there. You want to believe the best in people,” she added. Atkinson said the two had been having problems for several weeks prior to her Shanann’s death. She said Shanann told her that Chris was not acting himself during a recent trip to North Carolina. One neighbor who didn’t want to be identified said they appeared to be a normal family. “I didn’t see anything negative in their relationship,” the person said of Shanann and Chris. Another neighbor, Ann Watt, said she was in “absolute shock” at the killings, saying she had seen Shanann and the girls at the neighborhood pool. “I lost a lot of sleep over it last night,” Watt said. But he said, before learning that Chris was arrested in connection with the case, that “something just doesn’t add up” after seeing the interview with Chris. Other family friends say they hosted Chris and his daughters for a birthday party days before the alleged murders. Background checks and court records relating to Shanann and Chris Watts also revealed they filed for Chapter 7 bankruptcy in July 2015, and there was a civil claim filed in July of this year by the Wyndham Hill Master Association, the couple’s homeowner’s association, in Weld County court. Court records show there was a return date on a court summons set for Aug. 24 in that case. According to The Denver Post , the couple listed liabilities of more than $400,000 in its 2015 bankruptcy filing. Amanda Thayer said that Chris mentioned putting the house up for sale on Monday. "We spoke to Chris on Monday. He mentioned putting the house up for sale; him and Shanann had spoke about doing that," she said last week. Shanann’s brother, Frankie Rzucek, pointed out a fundraiser on Facebook created to help find the missing family that have now been turned into efforts to raise money for funeral expenses. Click here for more information about fundraisers and how to support the family.